It’s time for February’s Monthly MashUp and this is a really fun one guys! My friend Karly from Paisley Roots is the guest this month and we picked two gorgeous dresses to mash. I’ll get to the dresses in a minute, but first I’d like to introduce you to Karly in case you aren’t already familiar. I first met this hilarious lady in the Project Run & Play sew-alongs back in the day. Like WAY back in the day when it was just Flickr and before the link up. You know, back in 2012, hehe. Her youngest (she has 5 adorable children) was just a little baby back then, and looking through Karly’s posts was like a fun walk down memory lane. True, it’s only been a few years, but wow how much has happened since then? Karly and I both ended up being designers on different seasons of PR&P last year and she WON her season! She’s designed and released a couple of amazing patterns, there’s Paisley Roots’ a Giving Christmas series which I’ve been happy to participate in over the last couple of years, and of course her Anything Goes Friday link-up which is always a fun place for inspiration. I’m so happy to see Karly shaking it off and continuing to contribute to this fun community and I can’t wait to show you her mashUp on Thursday! Ok so on to the February patterns!! The first pattern is from Cali Faye Collection and I have to admit it’s my FIRST Cali Faye pattern. I’ve loved her style for ages now, so when Karly suggested the Gardenia dress I knew it would be the perfect way to get my feet wet. The first word I think of when I see the Gardenia is Bohemia. The breezy shape is perfect for running around outside in the warmer weather while the 3/4 sleeve gives some coverage for the cooler days. I made a 3T for the bodice sizing and kept the 3T length on the skirt even though I knew it’d be super short on Bean. She’s really a 4T length girl at this point, but I was so excited to get a few cute pics of her in a mini Gardenia. 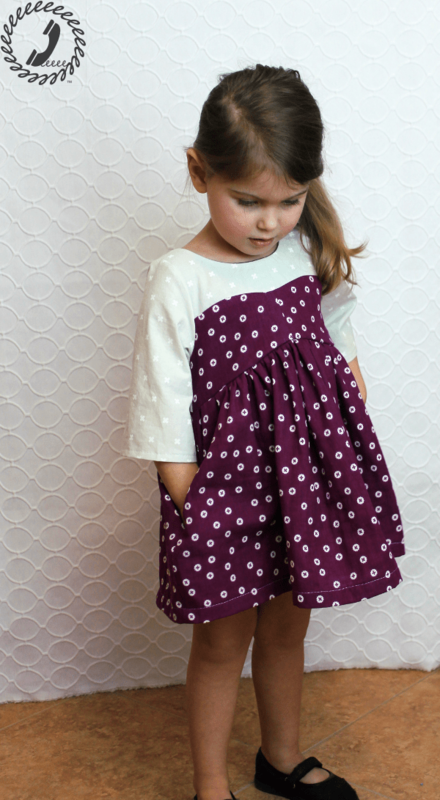 I really plan for it to be a top this spring since it has the perfect babydoll tunic shape, but how adorable are Bean’s little legs peeking out? I couldn’t help myself. The back has a keyhole opening which I closed with a giant button to match the purple in the skirt. 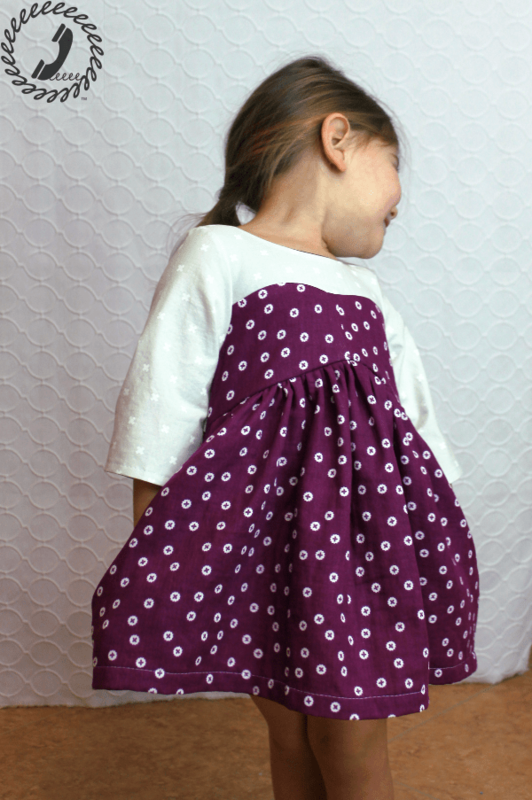 Both fabrics (and the double gauze lining) are from Imagine Gnats (*affiliate link). The cotton + steel bodice is the perfect pairing with the double gauze chest panel and skirt. The airiness of the design is made even more dramatic with the use of the double gauze. Bean looks like she’s floating around the room when she wears it. The pdf pattern sizing runs from 2T through 10 and there IS a women’s pattern if you’re interested in a similar shape for yourself. 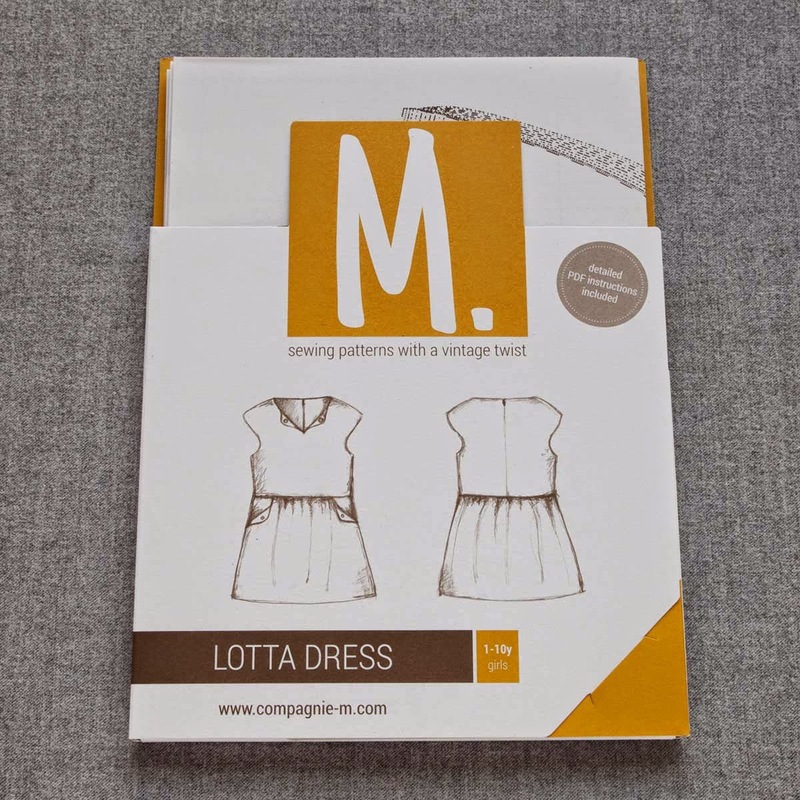 And the next pattern we used for the Monthly MashUp is the Lotta Dress from Compagnie M. We used the pdf pattern, but Marte recently started selling paper versions of her patterns, so if you’re not into the pdf pattern scene you can purchase a paper pattern directly from her site! 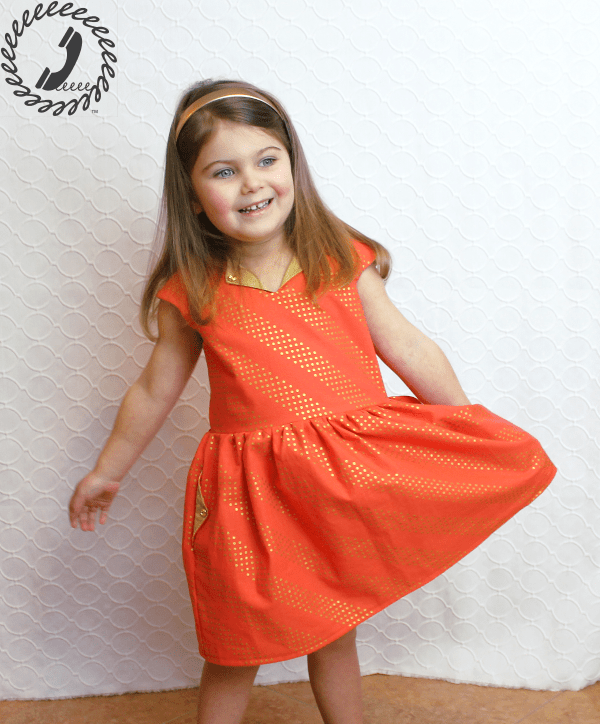 The Lotta Dress pattern is fully stocked with options. I adore the vintage feel of the dress with those cap sleeves, but she also includes a bodice that can accommodate sleeves if that’s a look you’d prefer. The sizing runs from 1y – 10y. There are three back closure options and I chose to use the invisible zipper. I find it’s speedy to sew and speedy to get on and off of Bean so a zipper is always a win for us. There are also three pocket options which are all adorable. I love the fold-over detail of the collar finding its way down to the pocket too, so I chose to sew these side seam pockets. And speaking of the fold-over detail, the neckline is perfection. 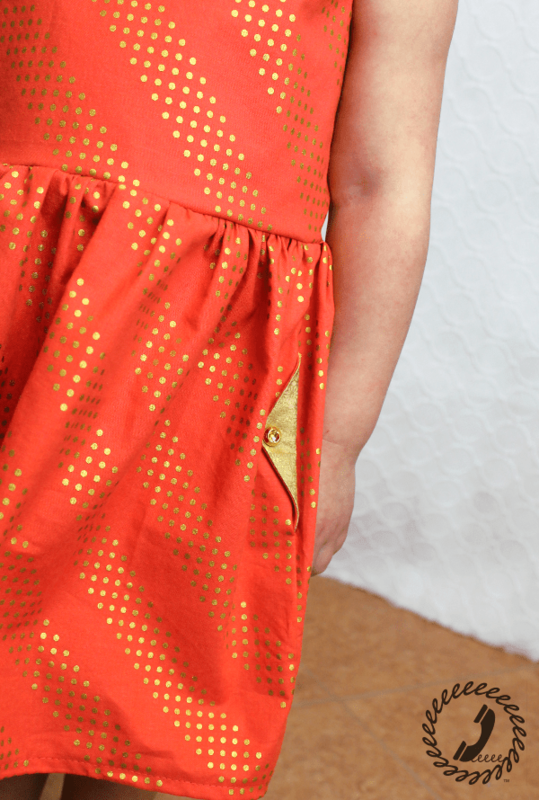 I used a gold quilting cotton from JoAnn Fabrics for a contrast lining and it really makes the gold dots of the cotton + steel (*affiliate link) pop. I hope you’re excited to see the mashUp (*UPDATE click here to see the MashUp) of these two great patterns! In the meantime, one of each of the mashUp patterns was generously donated by the designers, so let’s get the giveaway and link-up going! Don’t forget you can add ANY mashUp you’ve made in the past 60 days AND you can use your instagram pics so you don’t need a blog to link up anymore. The link-up will be open through the end of February so you will still have time to create this month’s MashUp if you’d like. I’ll feature some favorites from the link-up next month. Cool giveaway, and AWESOME dresses!! I'm dying over orange and gold. So pretty!!! 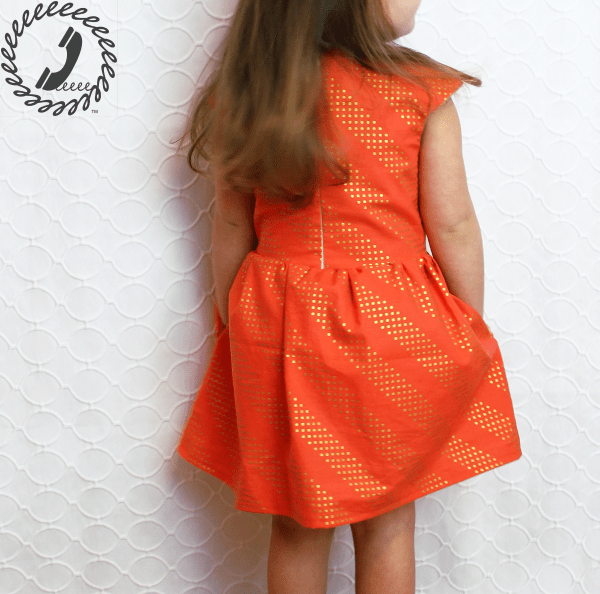 I wasn't sure if I'd love the orange combo, but as soon as I started sewing it I fell in love. It's so pretty in person! I was worried it would be so bright it would blind people, but the orange is such a pretty shade it totally worked out 🙂 Thanks Amy! Both very beautiful dresses. 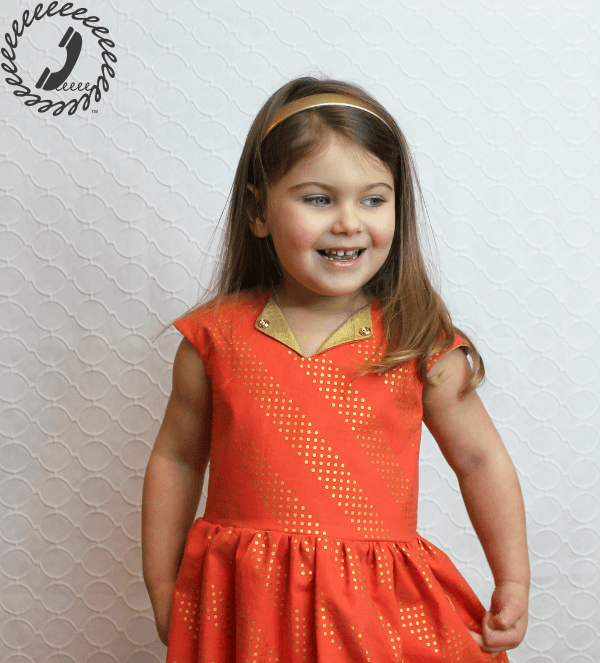 I have the Gardenia dress pattern too. Looking forward to giving it a go. Both of these dresses are so beautiful–I can't wait to see the mash-up! It's lovely Ajaire! Fabulous colour! I can't wait to see your take on the Gardenia Olu! Have you made one before? It's on my list make soon. Yes! I remember loving that one too! I love all the mashups you do! More non-dresses, maybe?